Clear Lake’s Don Humburg was an Iowa outdoor legend. Hunter, trapper, master angler, boat builder, decoy maker, you name it — if it happened in the great out-of-doors, Humburg could do it and do it well. 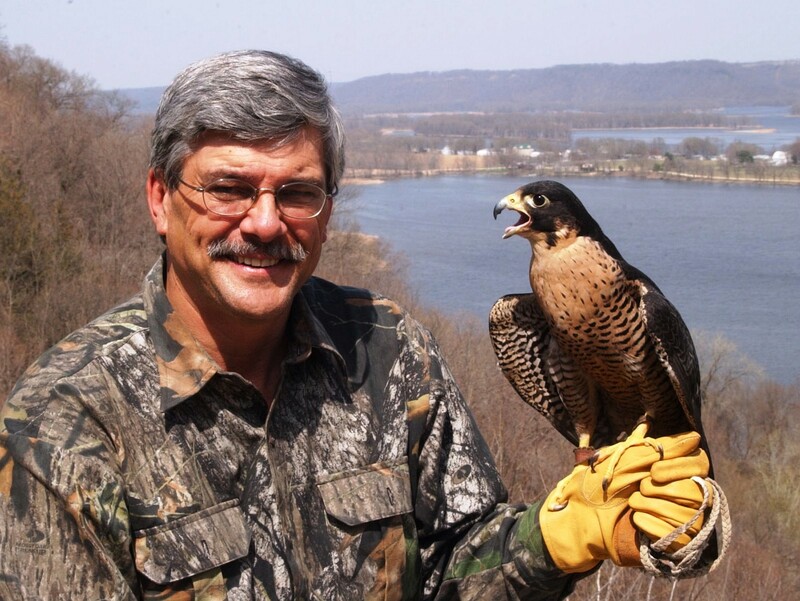 As a conservation crusader, Don was a tireless worker in the early days of Iowa Ducks Unlimited. But when the fall weather turned brisk and ducks were on the move, Humburg could most likely be found at the Ventura Marsh, monitoring the migration from the cockpit of one of his lightweight, hand crafted duck boats. Located at the western edge of Clear Lake, the sprawling Ventura Marsh was home to a collection of ten weathered hunting shacks. Humburg’s cabin – The Ventura Hilton — became a central focal point for outdoor discussions and roundtable debate. 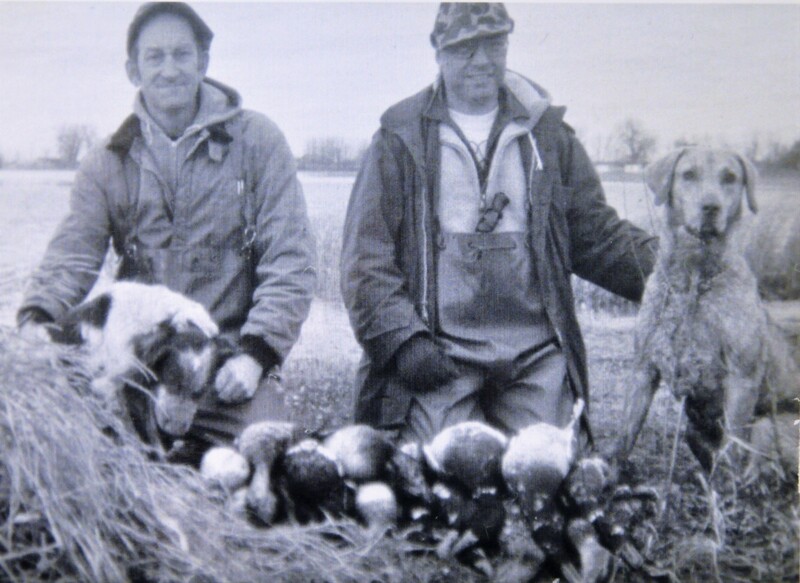 Once winter arrived and duck hunters returned home, Don stuck to the marsh, gathering prime muskrat pelts by chiseling through and trapping under the ice. Although it’s been nearly 15 years since his passing in December of 2002, Humburg remains a frequent topic of conversation among outdoor enthusiasts. Humburg was a downright pleasure to spend time with. Rain or shine, his outdoor wisdom and humorous observations never failed to keep duck blind conversations rolling. Speaking of rain, Humburg and I were hunting together the first time I attempted to hunt ducks with a muzzleloading scattergun. A real collector’s item, I had borrowed the gun from my friend, Ed Kotz. Manufactured in India, the 12-bore front loader had a beautifully burled walnut stock and 32-inch barrels. The locks had intricate hand engravings and the twin hammers had been formed into glaring snake heads. Although the old smooth bore consumed black powder in quantities to rival light artillery, it threw amazing patterns on paper and I was chomping at the bit to see how it would perform on the marsh. Our November hunt began with heavy overcast which soon gave way to light rain. Light rain became a downpour. It rained so hard that, even above the monsoon’s roar, you could hear individual drops pelting the decoys. Always prepared, Don had a big hunk of clear plastic viz queen which we fashioned into a surprisingly efficient, makeshift shelter. Although I tried my best to protect the shotgun’s caps, water was running off the barrels like a rain gutter. If any ducks should arrive, it seemed highly unlikely that the gun would fire. Despite the continuing deluge, a duck did appear – a lone mallard that sailed in and landed in the decoys before we could respond. Humburg decided that this would be an excellent time for me to give the muzzleloader a try. If the soggy blunderbuss failed to ignite, he would finish the job with his Remington Wing Master. We hollered and the duck jumped. Shouldering the gun, I quickly squeezed the front trigger. The hammer dropped and the cap fired, but all that followed was a muffled gurgling that I suspected might resemble the sound a moose would make while attempting to clear its throat underwater. Things took a turn for the better when, a split second later, the remainder of that sputtering charge decided to ignite. Although still somewhat mushy, the explosion was enough to send the load of #7 ½ shot on its way. The air filled with white smoke and the mallard fell, stone dead back into the decoys. Slack jawed and grinning from ear to ear, it was hard to tell which of us was most amazed. By the late 1960s, Humburg’s decoy carvings had become highly sought-after items – not just by other hunters but by nonhunting collectors as well. At regional gun shows, his decoy tables were sold out almost before the doors opened. When I returned home from the military in 1971, I received a wonderful surprise when Don presented me with a beautifully, hand carved drake wood duck. Although merely described as a “working block” the decoy was perfect in every detail. 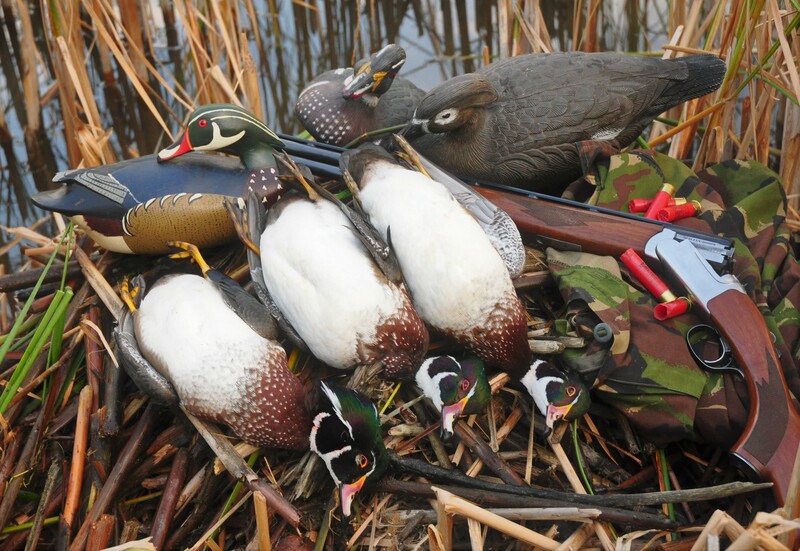 In the years that followed I used that drake, along with a small bag of lesser decoys, when hunting a favored out of the way, willow shrouded slough that was the nighttime roost for hundreds of wood ducks. Few people ever hunted the spot and following each excursion, I would carefully conceal the bag under some marsh vegetation. Worked great until the day I came to hunt and the bag was gone. Although maddening, the loss of the other decoys was no big deal. 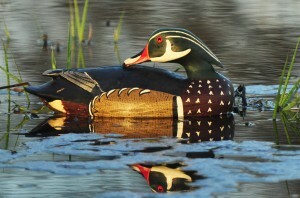 But the loss of the hand carved wood duck was devastating. The theft was completely avoidable on my part and I’ve kicked myself ever since. The decoy saga would have ended here had not my wife, Carol, visited the antique section of Ralphene’s Gift Shop. Located at the midsection of Clear Lake’s Main Drag, Ralphene’s is an excellent place to prospect for forgotten treasures from yesteryear. Today would be no exception. 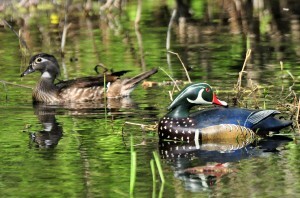 There, sitting on a shelf way in the back, was a beautifully painted hand carved, drake wood duck. Branded into the decoy’s base were the words “Carved by Don Humburg”. No, it was not the same bird I had once possessed, but the rare find was indeed fashioned by same hands. Well acquainted with the sad tale of my original decoy, Carol promptly had the wood duck boxed and gift-wrapped. When I opened the package, the sight of the decoy brought tears to my eyes. It was like finding an old friend. Following months of anticipation, the first nine-day segment of Iowa’s [North Zone] duck season finally began in late September. Returning to one of my favorite wood duck hot spots, I had added the Humburg decoy to a bag of “lesser blocks”. With each colorful sunrise of each new day, the woodies descended to our spread. Some I shot. Others I just watched as they swam in the decoys. Several ducks approached to within inches of the Humburg decoy. One hen approached the wooden drake on three separate occasions. With each new visit she would attempt to strike up a conversation with the decoy before swimming off again. She may have been in love. 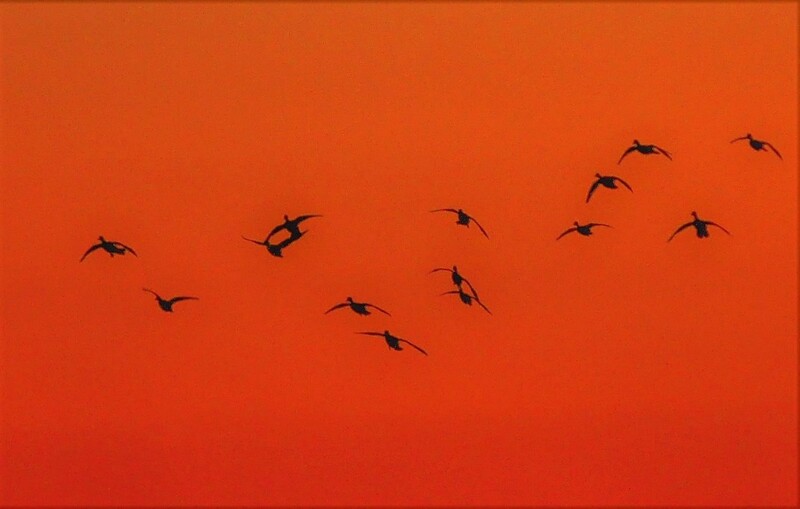 The days passed quickly and the final morning of the early duck season arrived all too soon. Following an extraordinarily colorful sunrise, more wood ducks piled into the hole than on any previous morning. Laying gun, decoys, and my bag of three fat, acorn fed drake wood ducks atop a muskrat lodge, I stepped back to admire the scene. 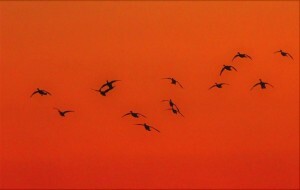 The final outing had provided a brief but memorable conclusion to this year’s early duck hunts. Collecting my gear, I couldn’t help but smile. 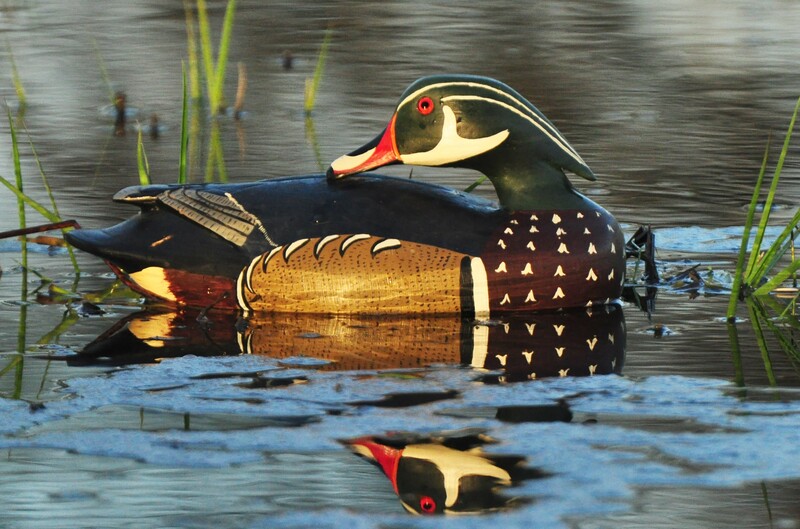 I’m sure Don would have greatly enjoyed knowing that decades after fashioning that beautiful decoy, wild ducks were still being fooled by his impeccable craftsmanship.